Insta360 and HTC have announced that you can now view Insta360 One X and Insta360 EVO photos and videos wirelessly on the HTC Vive Focus and Focus Plus VR headsets, with no stitching or copying required! Insta360 One X is a 5.7K 360 camera while Insta360 EVO is a 5.7K 360 camera that converts to a VR180 camera. Each camera has earned the highest praise among reviewers for their respective categories. Most 360 cameras like the One X and EVO use two or more lenses and the photos and videos from those lenses usually need to be stitched in order to be viewed. Insta360 One X and EVO are among the first 360 cameras that enable VR viewing of photos and videos without stitching. To use this feature, the user merely has to install the Insta360 VR app for Vive Focus or Focus Plus from the Viveport store and connect their VR headset’s Wi-Fi to the Wi-Fi signal from the One X or EVO. They will then be able to view the One X or EVO’s photos and videos immersively from the Insta360 VR app. This makes it much easier to review and share photos and videos from the One X and EVO immediately, without having to stitch them beforehand. 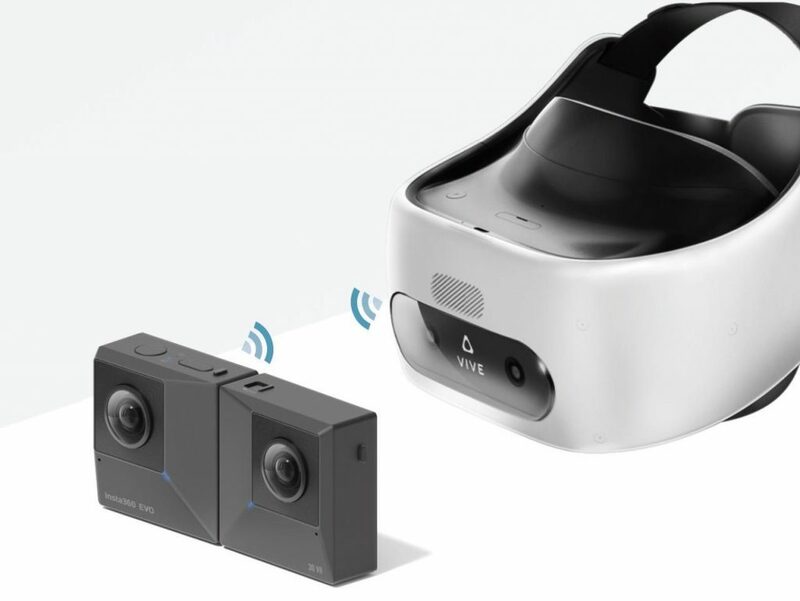 Insta360 has also enabled wireless viewing on One X and EVO for Oculus Go and Samsung Gear VR. Insta360 today announced a new partnership with HTC that will make creating and watching VR content easier than ever. Insta360 EVO, the innovative foldable VR camera, is now seamlessly integrated with HTC’s VIVE Focus and VIVE Focus Plus headsets, allowing for instant wireless playback and real-time VR preview during capture. “The VIVE Focus and Focus Plus are designed to make the most immersive VR experiences accessible to consumers and enterprise users alike. Now, when paired with an Insta360 camera, VIVE users can create, relive and share their best memories like never before,” said Alvin Wang Graylin, HTC China President. The camera integration is accomplished using the new multi-mode capability of HTC’s headsets. Multi-mode functionality lets users connect their headset to a wide range of third-party devices — from smartphones to gaming consoles — to experience an unlimited variety of both immersive and traditional content on their headset. Insta360 is HTC’s exclusive camera partner for this new broad-based VR ecosystem. Pairing the Insta360 EVO with one of HTC’s standalone headsets is simple. First, users download the new Insta360 VR app from HTC’s VIVEPORT app marketplace. Once it’s installed on their headset, they can connect directly to the Insta360 EVO’s onboard WiFi. Then, they can play back any of their favorite 180 3D or 360 photos and videos directly from the EVO’s memory card over a high-speed WiFi connection. There’s no need to transfer, stitch, edit or process the footage in any way — just capture, connect and play. And of course, if users do prefer to transfer footage to their headset for later playback, EVO also does this in a snap. VIVE users can also connect to the EVO during capture to get a real-time view of exactly what their finished project will look like in a VR headset. It’s the ultimate way for VR creators to ensure that they capture exactly the moment they want. Insta360 EVO is priced at $419.99 USD and available to order now via Insta360.com, B&H Photo Video and select retailers worldwide. I’m curious if you’ve tried viewing 180 3D 5.7k video from the Evo using a HTC Vive, Vive Pro or Oculus Rift? I transferred the video to my computer and tried viewing with both a Vive Pro and CV1 Oculus Rift. The video was in watchable. It started and stop, stuttered and lost sync with audio. My system is powerful enough to play any/all VR game titles and other content. Thanks for all your great articles and videos? I’m a big fan! Thanks Scott! My Oculus Rift is currently in storage but I will try with Windows Mixed Reality. Thanks, Mic! It’s kinda frustrating to have this powerful computer but not being able to view it smoothly in VR at 5.7k or even 4K! I must be doing something wrong!